This chunky guacamole is easy, authentic, fresh, and unbelievably, out-of-this-world, amazingly good with lime, garlic, onion & cilantro mixed in with wonderful avocados. It's the best guacamole ever. For real. Prepare all of the ingredients except for the avocados. In a large bowl (or molcajete if you have one), crush the chopped cilantro using the back of a spoon, grinding it against the bowl a bit to release its juices and aroma. Add the minced garlic to the crushed cilantro and crush that as well. Add the lime juice, salt, cumin, onion and avocado and mash with a fork until the avocados are mostly broken down and only smaller chunks remain. 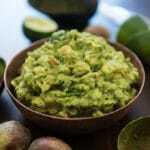 If you prefer chunkier guacamole, just don't mash it quite as much. If you prefer smoother guac, keep on going until it's the consistency you desire. Gently stir in the chopped tomatoes and jalapeno (if using, which I do not). You can top with a little extra chopped cilantro and tomato as a garnish or cover in an airtight container and refrigerate for an hour or so to allow the flavors to meld together a bit.